In honor of March “Mat-ness” we’re bringing you a series of mat exercises to target your core and abs. We recommend performing each move 8-10 times in a series — one movement after the other — and repeating the series three times for maximum benefit. Start in a plank position. As you bend your elbows out to the sides and lower your torso toward the floor, bend your left knee and touch it to your left elbow. As you straighten your arms, come back to plank position with your left foot next to your right. Lower your torso and touch your right knee to your right elbow. Then return back to plank position. This counts as one rep. Lie down flat on your back with your arms and legs up towards the ceiling. Take a deep breath and engage your abs. As you exhale, lower your leg leg while your right leg extends to the sky. Shoulders and head can stay flat on your mat or, as shown here, you can lift your shoulders and head while extending your left arm up toward your right leg. Switch sides and keep alternating legs and arms until you complete 8-12 repetitions. Kneel with knees hip-width apart and your hands firmly placed on the ground about shoulder-width apart. Brace your abs. Practice lifting one hand and the opposite knee just an inch or two off the floor while balancing on the other hand and knee and keeping your weight centered. When you feel steady and ready to move on to full range of motion, point the arm out straight in front and extend the opposite leg behind you. You should form one straight line from your hand to your foot, keeping hips squared to the ground. Hold the movement for a few seconds before switching to the other side. 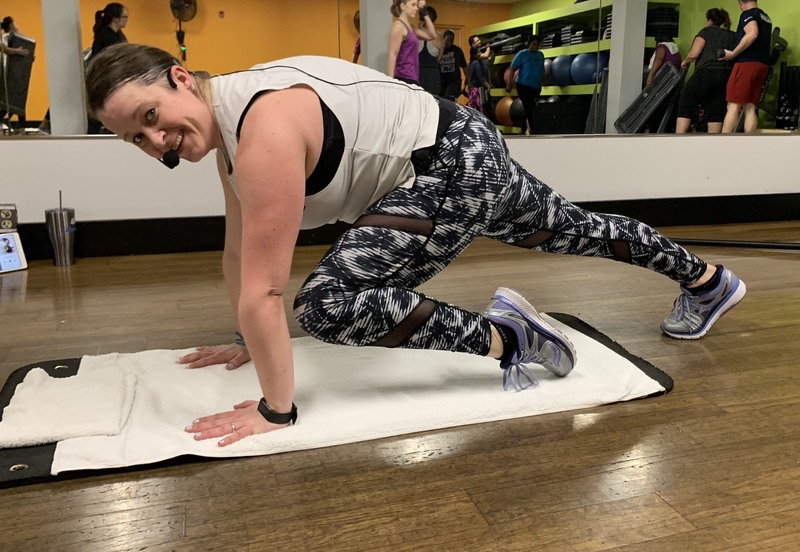 Your head should be in alignment with your back (your eyes should be looking down or on the diagonal in front of you; we asked Casey to smile into the camera, so be sure not to copy her form). Start standing with your right hand up by your head and elbow at about shoulder height. Bring your right knee up and out to the side as you crunch your upper body to the side, dropping your right elbow toward your right knee. Drive your knee up as you crunch your elbow down. Lower the leg back down and repeat 8-12 times on the right side before switching to do the left. Move as quick and controlled as you can without losing your form. 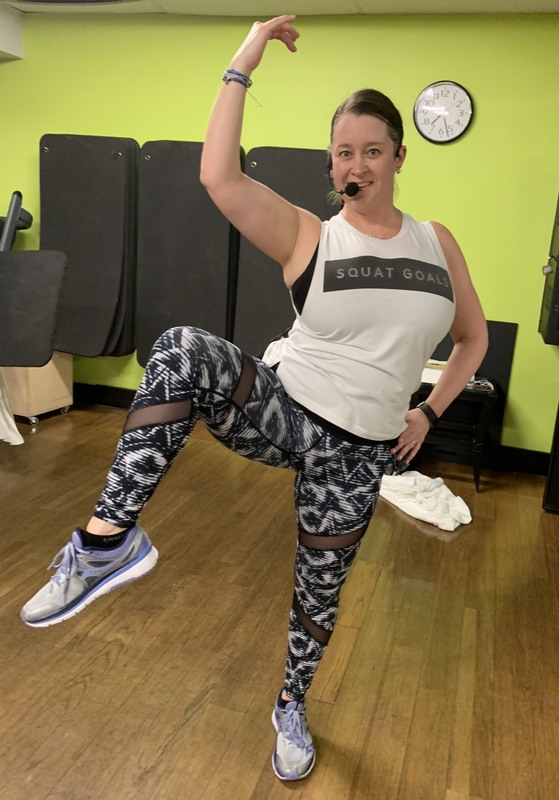 Thanks to CA personal trainer Jill Kitko Bernard for putting these exercises together, and CA/Haven on the Lake group fitness instructor Casey Otten for performing the exercises. You can find Casey teaching BodyPump, BodyShred HIIT, RIPPED, BodyFlow, and Barre Essence. 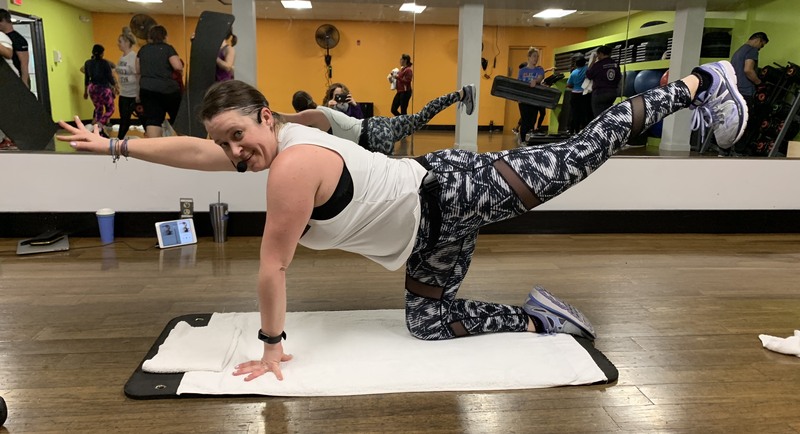 Jill teaches a variety of group fitness classes such as Insanity, Shallow Aqua Fitness and Aqua Yoga. She is available for personal training sessions; email her at Jill.KitkoBernard@ColumbiaAssociation.org. Interested in strengthening your core? 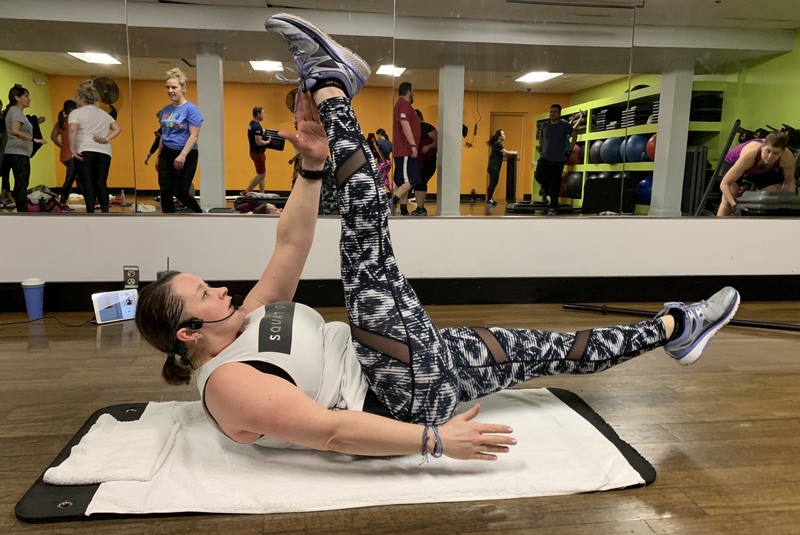 Join Tribe Team Training’s TribeCORE at Columbia Athletic Club and Supreme Sports Club, or enjoy a Pilates class or join with a private group at Haven on the Lake 410-715-3020.